If you have never supplemented with anabolic steroids before the following cycle and stack is not for you. If this is your first venture into the anabolic steroid world please view the Novice Cycle Links. Have completed at least one cycle successfully; preferably two cycles. Have supplemented with at least three different anabolic steroids and in a successful manner with all three. Have stacked at least two anabolic steroids together in a successful manner. These are the guidelines but there are few things you need to understand. If you have fulfilled the first three and are satisfied with the results you do not have to move to the next level. Many may run a novice level cycle numerous times and be happy with what they receive and that’s a good thing. The fewer anabolic steroids we can use and be happy with the better off we’ll be. Of course some will not be satisfied some will want more and that can be fine too; the ticket is having a solid plan in mind that provides those results in the most efficient way possible. Cutting Stack The following cycle and stack is well-suited for what many might refer to as “Lean Bulking” gains. While this can be a sound definition for this cycle it can only be to a degree. There are other cycles that will provide more growth but there is no cycle that’s going to cause you to gain fat; you can gain fat on any cycle if you eat too much. The following cycle will simply provide a decent amount of tissue gain but it can also be a good cycle for a diet if calories are restricted. Testosterone-Propionate is optimal but Testosterone-Cypionate or Testosterone-Enanthate can be used if the Propionate is a problem for you. Trenbolone-Acetate will really set this cycle off more so than any steroid in the stack. If you respond poorly to the hormone you might replace it with Masteron-Propionate at a dosing of 300mg per week; three injections of 100mg each. 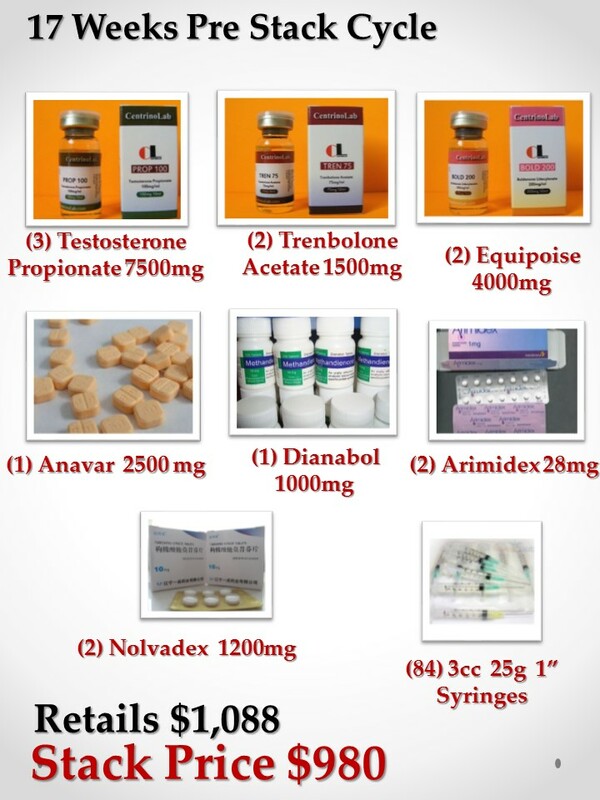 While Equipoise on its own is not a great mass builder, coupled with Testosterone-Propionate and the initial Dianabol use you will produce some very solid gains and see your strength increase very nicely. Further, EQ will promote a more conditioned look while you’re still growing. Arimidex may not be needed for some but most will be best served with this low dose. If aromatase related side-effects become a problem you will need to increase the dose to 1mg/eod and in most all men this will eliminate the problems. How much weight can you gain from this cycle? That’s a hard question to answer; it will greatly depend on how high your calorie intake is. If you are eating a maintenance level diet you may be able to put on 7-10lbs of tissue, this is excluding any water weight that might come with the Dianabol but any water weight will dissipate shortly after it’s discontinued. Further, the Arimidex will greatly help control this issue. Moreover, the higher your carb intake is above necessity the more water you’ll probably hold.